I have this embarrassing pile of boxes in my art studio for shipping items that I sell. It sits there and taunts me with its "unartistic" presence. And then today, Dexter decides to climb into the one box that provides the most adorable photo opportunity. 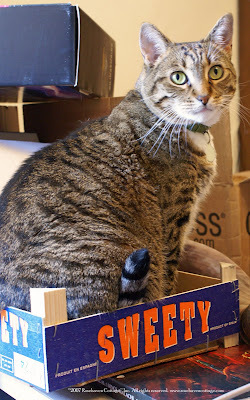 So even though I still hate the pile of boxes in the background, I couldn't help but shoot and share this photo of Dexter sitting in the most perfect box for him... the Sweety mandarine box. Dexter is truly a "sweety" in every sense of the word (I can gush because I'm his human). He is a kind and thoughtful male tabby that we see as a benevolent "king" over the other kitties living here at Rosehaven Cottage. His size is impressive with his muscle-y frame weighing in at about 17 lbs. but he is a demure and quiet tabby that will often just come up and tap us on the leg or arm to say, "I'm here. Please pet me." He is a great leash walker and when the leash comes out, he stands proudly waiting for it to be put on and latched so he can go walking in the garden with me. At night, he often climbs up on my chest just before I drift off to sleep and "grooms" me by licking my chin and face (sometimes my hand). He is my sweety Dexter. I always tell him, "I loved you first, and I love you best." He even looks like a wonderful cat. I wish I wasn't allergic! That photo is great! He sounds like a sweetie. He has a decisively masculine face. Dexter has written his autobiography with this photo session! Dexter looks a very handsome cat. I love the look on his face and the box is great. Just sums up Dexter. Dexter knows what box he belongs in: the Sweety box! He has a beautiful face. I would probably have to climb into a box called "Silly." What a lovely cat. The photo is so perfect! Wondering what kinds of roses you grow. When I lived in Calistoga my favorites were tea roses. Vintage Gardens has a wonderful selection of them. Also liked the hybrid perpetuals and Chinas. Here I'm just getting started and trying out the Hybrid Perpetuals, a few Bourbons, Bucks and more cold hardy roses- still miss my teas. A true sweety pie in a sweety box. :-) Dexters soft and gentle facial expression says it all, doesn't it? Lots of kisses for Dexter from all the kitties at Bliss! Dexter is so cute in his box! That really caught my attention because I have several pics of my cat Bratty in boxes! It seems the smaller the box, the more intriguing it is to try to get into the box!! I think it's neat that you take him out on a leash. I've been thinking of doing that with Bratty was not sure how well a cat would like that, but judging by your story, I may give it a try!